The Maze Runner has been compared with The Hunger Games, the incredible smash hit trilogy by Suzanne Collins that swept up teenage readers for the action drama and possible romance, and adult readers for the action drama and political dystopia. Other than the fact that it involves a brave teenager trying to survive in a Glade with a Maze (compared with a brave teenager trying to survive in an arena), that's really were the similarities end. Of course, you do wonder what kind of world is this? Who could do this to kids? But that's not the focus here. 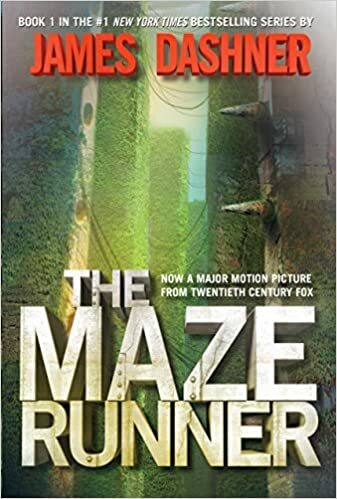 Unlike other "dystopian" books where teenagers and/ or adults are deliberately put into Do Or Die situations (Hunger Games and Bachman/ King's excellent The Long Walk and The Running Man ), we don't get the same tensions in The Maze Runner. The focus of this YA book is the boys - the teenagers who have been inexplicably delivered, one per month, to the Glade; with their memories wiped clear of everything dear to them, of what the past held. Knowing only their names and how to function, they are delivered to the Glade in a metal Box via a shaft. And all they can do is try to fit in and survive, while Runners figure out a way through the Maze, avoiding vile and deadly monsters in the process. They've spent two years trying to solve the Maze, mapping it and searching it, but every night, when the Glade walls close to keep them safe inside, the walls move and the Maze changes. Our hero Thomas, new to the Glade, disoriented and memory-less, knows only this: that he wants to be a Runner and he wants in to the Maze. He quickly establishes himself as a hero to some of the kids, but to others who have regained a little memory, he is someone not to trust at any cost. He is, by turn, brave and challenging, strong minded and moody, open then secretive. It took a while to get to know him - if we ever really do - but you know, that didn't seem such a bad thing because it took a while for him to know himself and what kind of person he might have been in his past life and his current life. Opportunities are lost to build some suspense and character development at times, flying through some scenes and rarely lingering on any. As a result, the writing lacks King's & Collins' suspense, and is littered with bizarre metaphors and dialogue at times. If I found similarities to other stories, I'd say there were snippets derivative of The Drawing of the Three (the second book in Stephen King's epic Dark Tower series). Magical doorways, small robotic creatures acting as spies, cryptic plaques on walls telling of times past and unknown people, talk of the Creators. Still, it had a fast pace and I found it to be a page turner, and while I guessed a couple of plot developments, some surprised me. The last two chapters felt somewhat rushed... merely an opening to writing a second book, but still with the some unexpected outcomes (especially for YA book). Overall I enjoyed it, and I have downloaded the sample of the sequel The Scorch Trials . While I gave all the other books mentioned here (Hunger Games, Long Walk, Running Man, and Dark Tower) firm 5 stars, this is a 3 to 4. The story is well worth a read but I'd have preferred a little more passion from more of the side characters & a little less rushing through some of the plotlines.